Hello …. Yellow…. Welcome back to my blog.If you are new to my blog and reading this article ,I suggest you read the previous post on Siem Reap in 48hours – Thing to do Day 1 first before reading this post.Please read the first post by clicking here. After a night of drinking sessions with new found friends at the Pub Street, the street become a dead quiet streets in the morning.Nearby the Pub Streets ,there is an Old Market nearby which is famous where the local sell foods ,craft and apparel.As I pass through the market, there are many locals people buying local produce and other stuff as well .You can also see many local people eating at the stalls operated by the vendors. Here is where I managed to get my 4-shirts from one of the vendor there for 20 US dollar. In here you need to bargain with vendor and I really mean it .Every tourist who come here must bargain for better price .Never ever pay the price they first offer you. Of course if you buy in bulks (if you have many family and friends which you need to give souvenirs) ,it give you more power to bargain for a much lower price.Better sharpen that bargaining skills before you start hunting for souvenirs! If you are in rush and no time to research where to buy souvenir or gifts for family and friends ,then you should come to this old market .You can pretty much get everything you need.I suggest you go in the morning rather than afternoon because it might get very hot inside and smelly due to fishes. 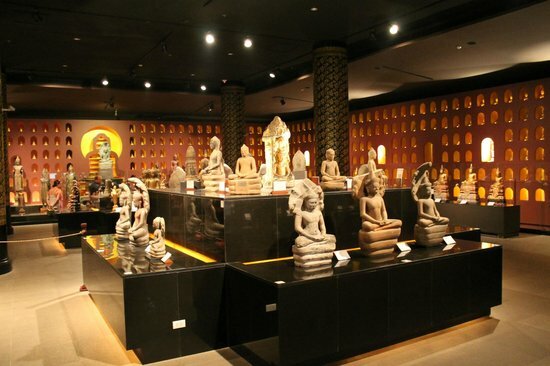 As a tourist , I would highly recommend to visit this museum ,it is well worth the money.This museum is full of history and even though you are not a history fan ,you will find visiting this museum is a must to go when you are here in Siem Reap. Where can I buy the tickets? How much is the tickets ? You can go directly to the museum and buy at the counter .They do accept cash and credit card as well.It about 12 US dollar per entry for an adult and if you like you can get the audio guide for 5 US Dollar which inside the audio guide it will explain every part of the museum with the number sign matching on your audio guide. If you want to save that 5 US dollar ,you can opted not to rent it from the counter as inside the museum , they already have explanation of history on the information stand everywhere in English and Khmer language as well. Can I take picture of the relics and statues inside the museum? So sorry people ,the museum doesn’t allow anyone to take picture once they are inside .No photography at all .Please respect and don’t do things which could get you in troubles.There is a reason why many museum don’t allow photography.The picture below is taken from Tripadvisor site to give you a glimpse on some part of the museum.This is Hall of 1000 buddha which I think is the most spectacular and amazing to see. The museum is well organised and informative about the history of Khmer Empire history. There a few halls which you need to follow the sequence how to walk around the museum . I would highly recommend people to go for this museum first to understand the history of Khmer before going to the Angkor Archaeological Park tour so you would understand the whole story .Beside that many of relics or statues has been transfer from the Angkor Archaeological Park because of safety reason (there are people around the world trying to steal and sell it at the black market) and preservation reason. This museum is also air-conditioned so you can spend up to 4 hours in here.Mostly an average person would take 2 hours to finish the entire tour inside the museum with a break for a cup of coffee in between. Yeap there is a small cafeteria same floor as the ticket counter if you want to have a break for drinks in between. Did I mentioned the museum is also very big ?Ok not super big like hypermarket but lot of halls to see all the history of Khmer Empire. Here is the goggle map link below if you wish you go to the museum as I mention. “Enjoy a stunning sunset dinner on the great Tonle Sap Lake aboard the magnificent Queen Tara, the biggest boat on the lake. Visit the floating village and see the local schools, shops, fishermen and smiling children. Relax and enjoy a drink and the view! ” Get your Guide . Okay Okay , I was smitten by this introduction when I browsing through things to do in Siem Reap when I was checking out some tour in Get Your Guide website . This Get Your Guide works similarly like any website where you can book local tour through it . I was looking for something to do in the evening and this fit the bills . It was sunset tour where the tour guide would bring you to ride a boat to visit the Floating Market and see the crocodile farm (which look pathetic ,not even a farm at all ,just a few crocodile inside this small space just beside the Floating Market filled with tourist eating and taking picture on top of the Floating Market) but the view is good. After that , the tour guide bring us to this big boat called the Queen Tara (which they claim is the biggest boat there ) for a buffet dinner .If a all you can eat and drink buffet. Honestly the food served is very limited and so so only but you can have unlimited beer or alcohol drinks from the boat bar which make is a plus point . This is what i called life ,drinking couple of beer and alcohol drinks in front of the boat watching over the beautiful sunset in the middle of Tonle Sap Lake. Definitely a plus point despite dinner not so great. The whole tour lasted about 4 hours include fetching you from your accommodation ,the tour to the floating market and so call crocodile farm and the sunset buffet dinner with unlimited drinks ,then back to your place. It cost me about RM160 which is nearly 40 US Dollar for this tour. Relatively ,I kinda find the tour a bit overrated and maybe overprice ? But overall it was a very good experience visiting the famous Tonle Sap Lake which I used to hear when sutdying Geography back in high school . If any of you interested in booking this tour I put the link below for you. Tonle Sap beside being the largest freshwater lake in South East Asia .It also served as a place for local communities surrounding it to earn a living through agriculture.This lake is one of the important contributor to the Cambodia economy beside tourism. I suggest not to come here during the monsoon season (June to October) as the water would rise up to 14 feets depth because of the water from the Mekong flowing into the lake.The best time to come here is during dry season which is between November to March. You can actually travel to Phnom Penh using the express boat from Siem Reap and it take about 6 hours to reach. In reverse it best to take this ride during monsoon season because if it is dry season ,the boat may get stuck with mud due to low water level.Sound confuse right ? Suddenly I ask you not to come and come during monsoon season .This really depends on what activities you want to do in Tonle Sap Lake. Always ask the local tour guide for advice when visiting Tonle Sap in which ever season you are planning to come. There is a Vietnamese communities living here beside the Cambodia communities and along the boat ride.You can see people trying to scam tourist by using kids performing carrying snake around their neck and tourist usually would take picture of this. After this they demand money from you and make pity faces so you would give them money during your boat ride to Floating Market.As advise by the tour guide,don’t give any money.Also you can see Floating school where both Vietnamese and Cambodian exist in harmony. *Disclaimer: I’m not linked to this hotel.com.I just found this article which I think might help you further understand about night market in Siem Reap. Ok. That kinda wrap up the 2 days itinerary on how you can visit Siem Reap if you have one 48hours only.Unfortunately I didn’t visit the Night Market as I was already too tired to do it after the dinner and went straight back to my hotel to rest. I hope you enjoy reading this post and be inspire to travel .You don’t have to follow exactly my itinerary and be spontaneous to explore others activities to do in Siem Reap.Just go crazy.